If you missed last week’s episode where the remaining competitors took on Stage One with four new obstacles Snake Run, Giant Log Grip, Broken Bridge and Flying Squirrel we have a full & detailed American Ninja Warrior recap, right here for you! Tonight’s episode looks like it is going to be a great finale, so be sure to tune in for our coverage of NBC’s American Ninja Warrior at 8PM – 10PM ET! While you wait for our American Ninja Warrior recap make sure to check out all our American Ninja Warrior news, spoilers, recaps & more! #AmericanNinjaWarrior is the Season 8 finale tonight and we’ll find out if we have a winner this year. Last year we had two complete the course but Isaac Caldiero didn’t participate this season and Geoff Britten went out early. We’ll see if anyone else can follow in their footsteps. We’ve got 17 Ninjas running in Stage 2. The obstacles include Giant Ring Swing, Down Up Salmon Ladder, Wave Runner, Butterfly Wall, Double Wedge and the Wall Flip which features increasingly heavy walls. They have 3:30 to complete it to move on to Stage 3 and the chance at the title. First is the youngest Ninja, Michael Torres. He struggled with Stage 1 and completed with 8/100th of a second to spare. He struggles immediately on Ring Wing but he finally hooks it after burning 30 seconds of his time. He loses control on a transition and goes down. Najee Richardson is ready to take on Stage 2 and it’s his first time in Vegas after a disappointing rookie year in 2015. He hooks right away on the first obstacle and moves onto the Down Up Salmon Ladder. He makes it down but then falls on the up. On the break Ethan Swanson ran and he also fell short on the Salmon Ladder. Now on the course is Adam Rayl, the third walk-on ever to get to Stage 2 in Vegas. He starts his run and locks in the ring right away. He puts that away in 22 seconds and moves to the Salmon Ladder. He completes and heads onto Wave Runner. He makes the transition but then falls into the drink and is out on the third obstacles on the course. Still, he went further than anyone else. He says he’ll be back again. Josh Levin is a rock climber and engineering student and will run next. 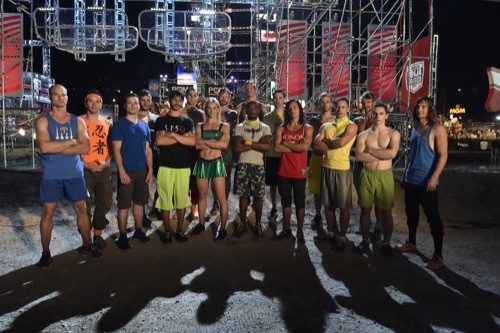 He locks in right away on the first obstacle and the rookie moves onto the Salmon Ladder. He gets off center then corrects. Now he’s on the Wave Runner and kills that too. He’s the first that will face the Butterfly Wall tonight. He’s got almost two minutes left. He leaps onto the rope and moves up. Now he’s on the Double Wedge. He makes small hops trying to stay locked in. He falls on the transition to the second wedge. Bummer. Jessie Graff is standing by preparing for her run. She says it was unbelievable to make it through Stage 1. She’ll be the first woman ever to compete on Stage 2 in Vegas. Kristine says the fans are all rooting for her when she runs later. Five down – will anyone make it past Stage 2? Fan favorite Grant McCartney is up next and he’s a pal with Crazy Craver. Neil is next, Grant is up now. He misses the first swing twice and then locks in. He moves on to the next obstacle but burned 45 seconds. He goes down on the transition to the up part of the ladder. Next up is Grant’s BFF Crazy Craver. He’s made it to Stage 2 the last two seasons but also went out on a Salmon Ladder both seasons. He zips through the first obstacle and faces his nemesis – the salmon ladder. He makes the transition and moves up. He did it. Now the Wave Runner. He swings to make a transition and just comes loose of the board and goes down into the drink. His grip strength failed him when he built momentum. Chris Wilczewski is up next and he locks in right away. This is his third time on Vegas stage 2. He moves to the Wave Runner and lands that too. Now he’s on to the Butterfly Wall. He makes the jump to the tope and struggles a bit but makes it up and over. Now he’s facing the Double Wedge. He makes the transition onto the second wedge but then goes down when the left side slid out of control. The #ANWFinale is looking grim for the ninjas. Every single ninja has gone down and Chris made it the furthest. Joe Moravsky is ready to run the course and he jokes that he only falls once per season. He’s made it to Stage 3 every year and hopes to do it again. He hopes to claim his spot as “the best” and make it to the top of Mt Midoriyama. Joe locks in right away and moves through the first obstacle after getting stuck on a transition. He’s on the Salmon Ladder. He heads for the Wave Runner now but falls when he tries to make the transition to the second one and hits the water. This is the first time of his Ninja career that he won’t see Stage 3 in Vegas. Next up is Drew Dreschel and he’s ready to beat this stage. He’s on the first obstacle and moves right past it. Now the Salmon Ladder and it’s quick work. He’s onto Wave Runner. He slipped on the second one but saved it with an epic dismount. Now he’s on the Butterfly Wall, leaps to the rope and is up and over. Now the Double Wedge and he’s got just a minute left. He has just 20 seconds left and he dismounts and runs. Finally, a finisher! Drew Dreschel dominates! He flips the three walls and is down to just a few seconds and slaps it with less than two seconds left on the clock and it’s the POM run of the night. He’s the first to make it and he killed the course. Impressive run and the first finish of Stage 2. Next is Brian Arnold and he move swiftly past the first obstacle and heads for the Salmon Ladder. He kills it and rapidly moves past the Wave Runner as well. Brian moves on to the Butterfly Wall, transitions up and is zooming through the course. Now it’s the Double Wedge. His bar gets off center and then he can’t recover it and he’s down into the water as well. Wow. The Double Wedge is a Ninja killer tonight. Brian says he had fun on the course and says he just enjoys being a better athlete. One finisher so far, who else will get there? Next up is Thomas Stillings in his funky pants. He starts out strong and locks right in. He moves to the Salmon Ladder but lost it there and him and his genie pants go down and get soaked. He tried to skip a rung on the fast pace knocked him out of Stage 2. Next is Jake Murray who is a speed demon. No fanny pack tonight and no corndog that we can see like he brought to Stage 1. He’s moving fast but carefully on the first obstacle. He went out last year on a Salmon Ladder. He makes the transition and moves up. Jake is onto the Wave Runner. He makes two big leaps to get off the obstacle and pounces onto the Butterfly Wall. He catches the rope low and climbs. Now it’s the Double Wedge with a little more than a minute left. He makes the leap but then goes down on the transition. Nicholas Coleridge ran on the break but fell hard off the Wave Runner after a spectacular tumble. Rookie of the year last year – Daniel Gil – is up next. He starts off with a fast lock on the first obstacle. He’s now on the Salmon Ladder. He comes in at an angle but corrects and moves up. He’s on the Wave Runner and off of it fast. Now the Butterfly Wall and he makes it to the rope then up and over. He makes the transition and moves on with a giant dismount and 15 seconds left. He slaps the buzzer with almost four seconds left. Drew Dreschel greets him with a hug as the only other Stage 2 finisher so far tonight. There’s just one runner left tonight – Jessie Graff – the first woman to ever face Stage 2 in Vegas. Jessie starts the course and locks in right away. She moves to the next ring and then gets stuck but makes past it. She moves on to the Salmon Ladder. She makes it on the down side and moves to the up and makes the transition. She moves on to the Wave Runner. She’s on the first one and moves to the end. She tumbles as she goes to make the transition. The crowd is on their feet even though she feel because she did better than a lot of the men. Now it’s time for Stage 3 and only Drew Dreschel and Daniel Gil will face it. Keylock Hang is up first then Floating Boards, Ultimate Cliffhanger, Curved Body Prop, Hang Climb and then the new Walking Bar then the Flying Bar. Drew Dreschel is up first. This is his second year on Stage 3. He’s onto the Keylock Hang and it’s like the Circuit Board from Indianapolis. He’s through and onto the Floating Boards. He beats that too and faces the new ultimate cliffhanger. He’s moving fast. He makes the leap and the dismount. Now it’s the Curved Body Prop. He’s moving fast but has to make the ascent which is tougher. He makes it and moves to the Hang Climb. This is where he fell out last year on Stage 3. He went down on it again. Wow. With just two more obstacles left, Drew Dreschel went down exactly where he did in 2015. He’s stunned and now it’s down to just Daniel Gil. Daniel is on the course and is on the Keylock Hang. He goes for an early dismount and skips most of the third panel of the first obstacle. Now he’s on the Floating Boards. He gets past that and it’s the Ultimate Cliffhanger next. He makes the transition and then slips and falls on the Cliffhanger and didn’t make it quite as far as Drew Dreschel. Daniel and Drew hug it out but there’s no winner this year. Drew is still crying after his loss. He’s shaken up and says he let a lot of people down. Daniel says they put so much into this and you get just one shot a year and says they’ll train harder and come back next year to climb the mountain. This year was tough.